Preheat oven to 350°. Spray a glass baking dish with vegetable oil cooking spray. 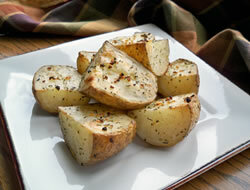 Place the olive oil, garlic, and rosemary, and salt and pepper to taste, in a large resealable plastic bag. 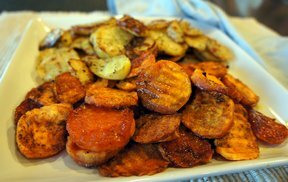 Add the potatoes, seal, and toss to coat evenly. Pour into the prepared baking dish. 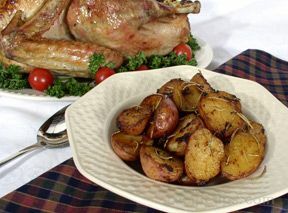 Roast the potatoes for about 30 to 40 minutes, until crisp on the outside and tender inside.